The traditional models have been disrupted by the on-demand dispatch software that facilitate on-demand delivery, which in turn helps in better customer acquisition at lower investments. The on-demand economy has brought about the requirement to be more efficient and provide instantaneous services. Transportation, logistics, courier and food are few of the many industries that have changed immensely with the advent of on-demand application. It has improved customer experiences on a large scale in the recent days when people do not have the time to wait, and expect instant responses to their needs. 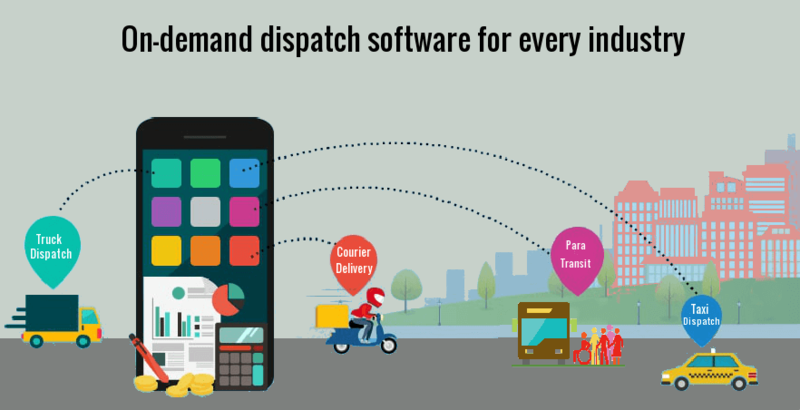 The on-demand dispatching is the long-awaited solution to the need of the public for a software that could make their lives simpler. The on-demand software should be able to report on every aspect and point of dispatch and streamline operations with a flexible and intuitive interface with the following features. It should be an end-to-end technology platform that addresses multiple deliveries, dispatching, scheduling, billing and the like, simultaneously. The application plays a vital role in improving the transit operations. The user-defined settings should provide the flexibility to accommodate more reservations and become more time and cost efficient in a short time. The on-demand software can tell you everything happening during operations for perfect planning and operational efficiency. Ensuring information accuracy and accountability, the on-demand application serves to prevent errors in dispatch and delivery to a large extent. With real-time routing, the software empowers you to discover efficient route solutions according to the customer needs and perform at the higher level. It provides real-time access to fleet status and other resources eliminating inefficiency in the dispatching process. It simplifies the complexities in fleet management by automating the entire system using advanced technologies. The application provides statistics that allows for proactive decision-making to offer the best customer services. By producing a range of forecasts to calculate on the flaws and market demands, the software can help you minimise delays and take growth to an elevated level. With a robust and feature complete on-demand dispatch software, point to point deliveries become more reliable and demand responsive. It is an easy solution for easy scheduling at an affordable price.